Sailor Mazher Hussain has lived through his fair share of stormy seas aboard the marred wooden dhows that ply the Gulf between Dubai Creek and Iranian ports. In Deira, while loading his 170-tonne cargo vessel to prepare for a shipment to Kish island in Iranian waters, Hussain said dhows rafted in Dubai Creek are bracing for more financial bad weather after a fourth round of United Nations' sanctions have stemmed the flow of restricted materials into Iran. "The business has come down 70 per cent because of all this political stuff," Hussain, 48, told Gulf News, surrounded by walls of stacked boxes containing everything from vegetable oil and wall tiles to refrigerators and diapers. The latest sanctions have clamped down on all military shipments and financial transactions with Iran by member states. Under the blistering 45 degrees Celsius midday heat, Hussain shakes his head at the prospect of dwindling business for himself and eight crew members with no relief in immediate sight. He grabs a tyre that looks like a giant doughnut wrapped in blue plastic and throws it with others on to the foredeck of his vessel, noting that of late to stay afloat, the ship's manifest carries less glamorous goods. "Now there is less movement from here to Iran nowadays, not like before. It's not how it used to be," said Hussain who hails from Pakistan. "Now we are taking tyres, blankets, quilts and edibles." The secret to making a good haul on the high seas used to be in the taking advantage of currency differences when goods could be purchased for less in Dubai, then shipped to Iran and sold for a higher mark-up value. A less favourable economic climate, currency volatility and stepped up dockside inspections to meet the letter of the new sanctions have resulted in slower turnaround times, he said. "The loading now has decreased. Earlier, one single dhow was filled up in a day. Now it takes a week," Hussain said. "In one day, the load used to be worth Dh100,000. Now to reach that Dh100,000 it takes a week. It's very slow. If business picks up, work will get better." Isha Srbani is an Iranian sailor who has been sailing for more than a decade on Gulf waters. Nearby at the helm of a large wooden dhow with gunnels splashed with baby blue paint, Srbani and workmates sit idle, chatting about family and home while looking out at the empty foredeck of their ship still awaiting a load of cargo. Srbani wouldn't elaborate on why no cargo was loaded but he said shipping has slowed in recent weeks with fewer trips. "We're still shipping rice, shoes and TVs," he said, but at a slower rate. "It's been no problem." 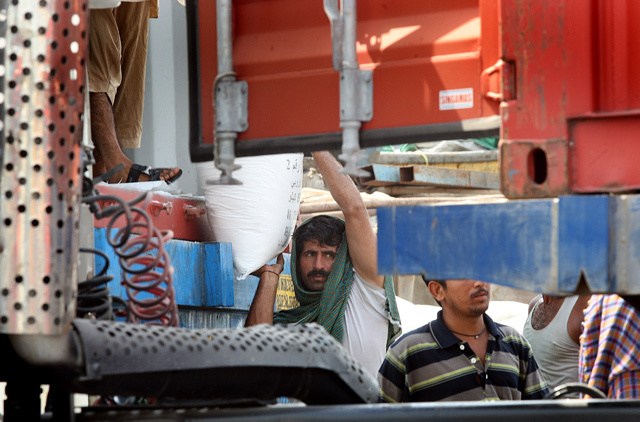 Other workers along the Deira wharf declined to speak about the UN's Resolution 1929 that was approved on June 9. In a statement, the United Nations said: "Expressing deep concern about Iran's lack of compliance with its previous resolutions on ensuring the peaceful nature of its nuclear programme, the Security Council imposed additional sanctions on the country [Iran] … expanding an arms embargo and tightening restrictions on financial and shipping enterprises related to ‘proliferation-sensitive activities'." The UN noted that the Security Council "affirmed that it would suspend the sanctions if, and so long as, Iran suspended all enrichment-related and reprocessing activities, as verified by the International Atomic Energy Agency (IAEA), to allow for good-faith negotiations. It also affirmed its determination to apply further measures if Iran continued to defy the just-adopted text as well as previous resolutions." In early July, US President Barack Obama signed the America's Iran Sanctions Act calling the measures the "toughest sanctions against Iran ever passed by the United States Congress". According to a US statement, President Obama said, "we are going to make sure that these sanctions are vigorously enforced. At the same time, we'll work with our allies and friends to refine and enforce our own sanctions on Iran." According to media reports, the UAE Central Bank ordered the freezing of 41 bank accounts held by Iranian businessmen. Remittances from the UAE to those Iranian parties were also frozen, according to a notice sent out by the central bank to financial institutions. The efforts have the support of the Iranian Business Council (IBC) in Dubai, one its senior officials told Gulf News. Morteza Masoumzadeh, Vice-President of the IBC, said, which has a roster of about 1,000 companies, said his group believes commerce with Iran will drop in 2010. "The value of trade transaction between UAE and Iran last year was [an estimated] $7.8 billion," Masoumzadeh said. "We certainly expect the volume of trade transaction between Iran and UAE within the current year to drop to the extent of $1 billion to $2 billion." Masoumzadeh said that the UAE continues to enforce strict customs inspections on goods leaving the country bound for Iran. "Indeed, we have observed from the beginning of the current year that UAE customs are very strict in checking of the goods destined for Iranian ports," he said. Unlike larger cargo container shipments aboard large ships traveling to Iran, dhows leaving Dubai Creek to cross the Gulf account for a smaller portion of goods shipped, he said. He said "traditionally, dhows are mainly engaged for shipments of small consignments of foodstuffs, household items, home appliances as well as textile, timber, iron and steel." Dubai Customs couldn't be reached for comment by press time on the latest inspection measures. David Butter, Regional Director Middle East and North Africa Economist Intelligence Unit, said that shipments from Dubai represent "10-15 per cent of Iran's total imports." Continued sanctions will have a negative affect on Dubai's exports to Iran, he said, but the big question remains: "How much?" "In my view, we will probably see a leveling off or a reduction in exports to Iran," said Butter in an interview from London. While exports are predicted to drop markedly this year to Iran, Dubai exports remain strong to other countries, shoring up potentially huge losses for some firms, he said. 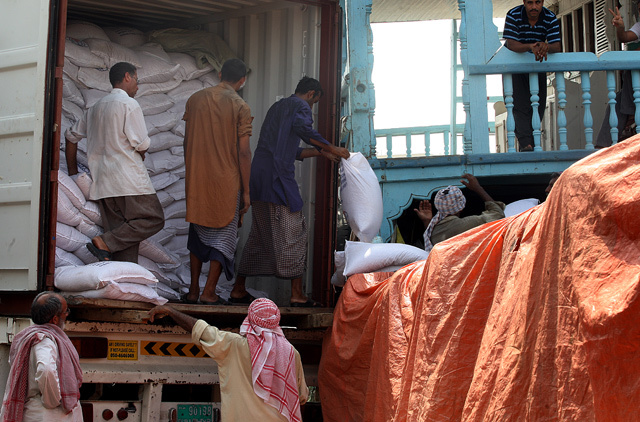 "We have already seen a significant increase in re-exports to Iraq, Saudi Arabia and the GCC. They're collectively more important for Dubai than Iran," Butter said. Earlier this month, Iran's Mehr news agency reported that Iran will curb trade with the UAE in response to the freezing of the 41 bank accounts in the emirates. According to Mehr, Masoud Daneshmand, Chairman of the Iran-UAE Joint Chamber of Commerce, said: "We don't approve [of] the Emirati behaviour because they are taking measures of their own volition which they are not required to take by the Security Council resolution and Iranian traders don't like this." The sabre rattling could be viewed as a completely typical response from the Iranian business sector when potential trade activity is threatened. "I would say this, for the moment, is being rhetorical. I would assume quite a significant part of this is the Iranian private sector," Butter said. "I think the Iranian government would be hesitant to take measures that could risk a backlash." Iranian Deputy Commerce Minister Babak Afqahi claimed the UN sanctions have not impacted cross-border trade for Iran and said that Iran enjoys $100 billion worth of trade and business dealings with as many as 160 countries, Mehr reported. Afqahi said that in the first quarter of 2010 Iran's non-oil exports to more than 100 countries were up by 27 per cent over 2009's first quarter and were worth roughly $5.8 billion. On the southern shores of the Gulf, meanwhile, latest figures gathered from trading members belonging to the Dubai Chamber of Commerce and Industry show that exports from Dubai to Iran have slumped for the month of June. "Although Iran continued to top non-GCC destinations, exports to the country posted a 9 per cent decline to Dh4.7 billion. Nonetheless, the country remained the largest single destination of members' exports during the month," the Chamber said. Across the board, however, exports shot up in June from Dubai to other destinations by 3 per cent over May. June figures showed that Dubai posted one of its strongest overall months of exporting goods in the last 10 years with more than Dh18 billion in goods shipped from the country. The number of exporters, the Chamber said, also increased in June by 49 to 4,863 trading companies which received a total of 57,306 Certificate of Origin certificates. "This is the second month in the first half of the year when the value of exports and re-exports of our members has exceeded the Dh18 billion mark, which is a good sign and an indicator of better export figures in the coming months as the trend will further enhance the status of Dubai as an ideal business destination in the region," said Hamad Bu Amim, Director-General of Dubai Chamber, in a statement. No customs duties on such goods shall be collected since being exported from the local market or locally manufactured. Receive and check the necessary documents required for customs declaration processing. Deliver client's own copies and retain customs copy. Export permit in event of exporting restricted goods. Sale invoice from a licensed company in the country addressed to a company outside the country or operating under an approved customs system showing total quantity, description and total and detailed value of each item. A detailed packing list as per weight, method of packing and HS code of each type of goods contained in the shipment. According to latest trade data from the Dubai Export Development Corporation, Iran receives a wide variety of goods and was listed as one of a handful of ‘top direct export destinations in 2009'.